ARA Nueve de Julio (C-5) was built as USS Boise in 1936 by Newport News Shipbuilding and Dry Dock Company, Newport News, Virginia. Boise was sold to the Argentine Navy on 11 January 1951. 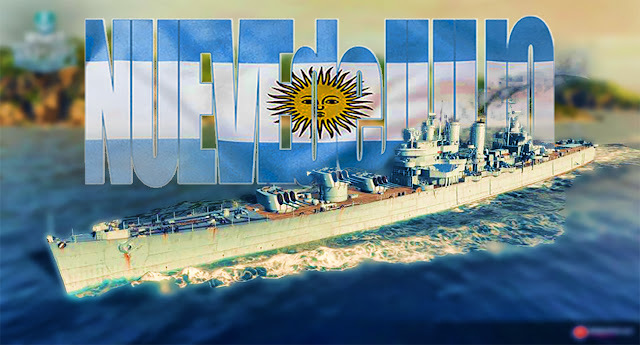 During her service in the Argentine Navy, she participated in the 1955 Revolución Libertadora, when she shelled oil depots and military facilities in the city of Mar del Plata, along with a flotilla of destroyers, on 19 September 1955. She was accidentally rammed by her sister General Belgrano (Belgrano was eventually sunk by the Royal Navy Submarine HMS Conqueror during the Falkland Islands War 2nd May 1982). Value in Currencies at time of WGB publishing. Main battery - 5x3 152 mm. Firing range – 13.6 km. Maximum HE shell damage – 2200, COF – 12%. Reload time - 10 s.
Maximum dispersion - 126 m.
8x2 20 mm, Range - 2.0 km, DPS - 48. 6x2 40 mm, Range - 3.5 km, DPS - 69. 4x4 40 mm, Range - 3.5 km, DPS - 64. 8x1 127 mm, Range - 4.2 km, DPS - 58. Maximum speed - 30 kt. Turning circle radius - 810 m.
Rudder shift time – 9.2 s.
Surface detectability – 11.9 km. Air detectability – 7.6 km. Detectability after firing main guns in smoke – 5.64 km. ARA Nueve de Julio has access to a modified British cruiser Repair Party. This heals up to 40% of the ship's hit points per charge over 20 seconds. She queues up to 33% of citadel damage and 50% of penetration damage. Active for 20 seconds @ 660hp / s.
Hits to citadel restored: +33%.